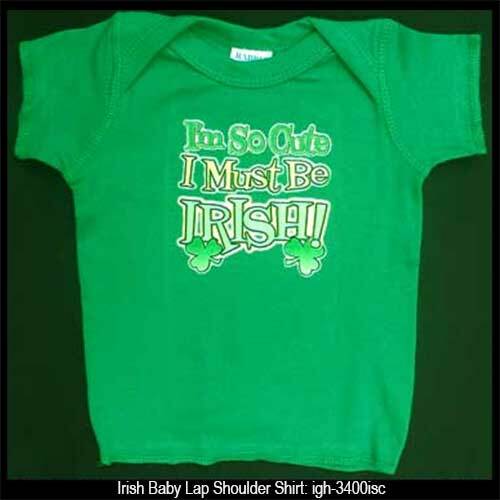 This baby size Irish t-shirt features the I'm So Cute I Must Be Irish motif that is enhanced with shamrocks. The pre-shrunk, 100% cotton, Irish baby shirt has a multi colored design on a Kelly green lap shoulder design. The Rabbit Skins brand shirt has raw edge hem sleeves and bottom. This child size Irish t-shirt features I'm so cute I must be Irish along with shamrocks. This toddler size Irish baby shirt features the I'm So Cute I Must Be Irish motif.